Back in February 2014, we looked at what factors may help you determine the market value of a classic car, either for selling or for buying purposes. Hemmings Collector Car Marketplace provides a very specific guide to use when doing so, but what if you are looking to buy a classic motorcycle instead of a car? 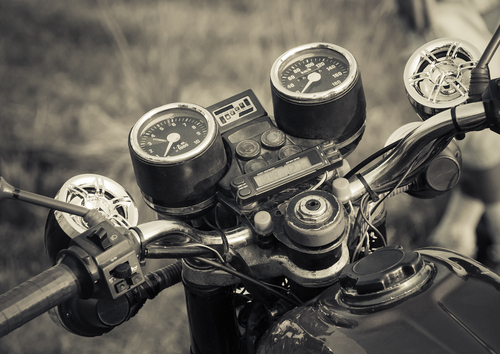 Determining the value of a vintage or classic motorcycle can be tricky, but it’s an important part of your buying process, especially since your classic motorcycle insurance policy will be affected by this value. Experts recommend having a professional motorcycle appraisal done, but motorsport expert John Glimmerveen offers the following basic factors that affect the value of your bike. Pricing trends. The market value of the bike you are looking to purchase may be decreasing. It’s important to do your research online and through other resources for your specific classic motorcycle to determine if it is in fact decreasing in value, remaining stable, or increasing. Repair costs. Will it cost you more to make repairs than it will to buy the bike? If those repairs won’t raise the value to a profitable amount, the bike not be worth the purchase. This will vary though on whether you are looking to get the bike into riding shape or make it museum quality, which brings us to the next factor. Purpose. If the purchase is being made as an investment, and you intend to restore it, you may be willing to pay a little more than if you were to purchase for riding pleasure only. When it comes to rare motorcycles, enthusiasts are usually quick to buy if it looks good, but if you are buying it to ride, the mechanical functionality is much more important than its looks. Rarity. How many are on the market? At Condon Skelly, we know how exciting it can be to buy a classic motorcycle or start a collection of antique vehicles. We’ve been helping our customers protect their classics with affordable, industry-leading classic motorcycle insurance coverage since 1967. We’re a group of collectors, enthusiasts, and professionals who specialize in insuring all types of collector vehicles. For more information, please contact us today at (866) 291-5694. This entry was posted in Classic Motorcycle Insurance and tagged classic motorcycle, classic vehicle restoration, collector motorcycle, Insurance, market value, rare motorcycle, value. Bookmark the permalink.